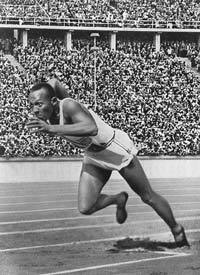 Jesse Owens was born as James Cleveland Owens. He was an African American athlete who competed in track and field. He specialized in sprints as well as the long jump. Owens achieved international fame when he won four gold medals in the Berlin Olympic Games, a feat that no athlete before him had achieved. In honor of Owens’ significant career, the Jesse Owens Award by the USA Track and Field association is given to the best in track and field. It is the highest accolade anyone in this sport can achieve. Jesse was the youngest son of ten children. He had three sisters and six brothers. He was born in the town of Oakville, Alabama. They later moved to Cleveland during what was known as the “Great Migration” for better opportunities. Owens was only nine years old during this time. In school, when a teacher asked him for his name to add to the roll book, he said that he was “J.C.,” but his Southern accent led his teacher to believe that he said “Jesse.” This name stuck with him and he was called “Jesse Owens” for the rest of his life. Owens was part of the United States track and field team during the Summer Olympics of 1936 held in Berlin. It was said that Adolf Hitler used these games in order to show the world the superiority of his Aryan race. Nazi propaganda was said to consider ethnic Africans as inferior. However, Owens proved them wrong by securing four gold medals. He won the 100 m sprint, the long jump, the 200 m sprint and he was part of the winning 4 x 100 m sprint relay team. Owens credited the German, Luz Long, for giving him technical advice on the long jump. It was said that he developed a strong friendship with Long. Right after the Berlin Olympics, Owens went back to the United States in order to pursue an alternative career. He refused an offer to compete in Sweden, which infuriated the Olympic Officials. They took his amateur status away which prohibited him from competing. This ended his career as an athlete immediately. Owens claimed to have taken on different jobs as a sports promoter and an entertainer just to make enough money for his family. He would preform at events that he considered “circus acts.” There were times when he would race against a horse just to feed his family. Although many people had told him that it was degrading for him to engage in such activities as an Olympic athlete, he told them that his four gold medals could not put food on the table. Despite being an athlete, Owens was a pack-a-day smoker. He smoked cigarettes for over 35 years. He was hospitalized after being diagnosed with an extremely aggressive type of lung cancer. Owens died in Arizona in 1980. The dormitory which he used during the Berlin Olympics was converted into a museum.